Publican/Hardware shop owner and wool merchant Colman Keane with some of his old ledgers in his premises at Gort. Photograph by John Kelly. 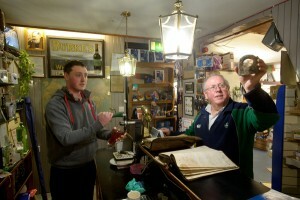 Open in one form or another for two centuries, Keane’s shop in Gort has survived booms, busts, the war of independence, the civil war, the world wars, the dawn of electricity, the online revolution, pay parking and everything in between. 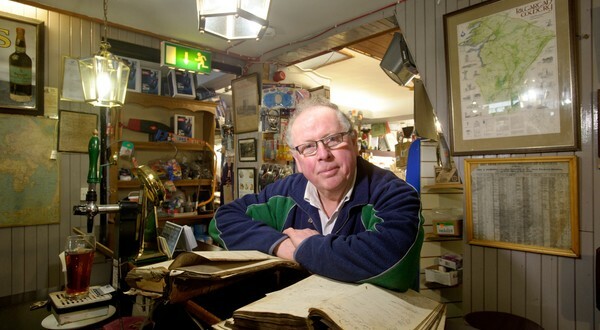 Now as owner Colman Keane looks to the future, he recalls a few tales from the past including one about WB Yeats, the shop’s best-known debtor – albeit, he says, that story may involve a “small amount of poetic license”. Of Down and Derry ancestry, the Keane family arrived in the town from Craughwell around 1812. “As Napoleon was retreating from Moscow, we were attacking Gort,” Colman laughs. “Our first establishment was on the Galway Road. We had a cinema there for the silent movies in the latter part of the 19th century. That building is still there, derelict practically, and we moved to Bridge Street a short time later to the site where we are now,” he outlines. Today Keane’s is a hardware shop at the front, which he claims sells “everything from a needle to an anchor”, a bar at the back and a wool merchant and farm supplies store in the yard. Sitting at the small bar, Colman has a wealth of stories illustrating the changes in day-to-day life in his shop, among his customers and in the town, offering an insight into life in Ireland over the last 60s years and more. “As a child I remember distinctly the fair days as cattle and sheep, on the first Tuesday of every month, would be on the street, with an inch of muck outside and I as a young child of seven or eight used to try to clean my shoes coming in, my father used to always say that is clean dirt which I appreciate today but not at the time,” he says. “I remember tea coming in, in chests and kneeling on the floor with my brother Raph, having to bag the tea the night before a fair day into pounds and half pounds, bacon coming in from Matterson’s in Limerick, and the side where the rib cage would have to be taken off, rashers sliced. In today’s world, it would not be allowed but I don’t think too many people got sick. I don’t think too many people got tummy infections because of those particular days,” he says. “Butter was unique. You had in the ‘60s and the ‘70s, people living adjacent to the town who would bring in country butter, who would bring in eggs. You might have a barter trade for tea, or coffee or whatever,” he adds. In fact, tea and coffee were not in short supply in the early years of ‘The Emergency’ despite rationing. “I heard stories that during the Second World War, tea and coffee were impossible get. Fortunately my father had quite a substantial order in prior to the embargo of shipping of tea, so he had quite a bit of it, and a merchant next door to us here called Bernard Coen had coffee. So between Keane and Coen, Coen and Keane supplied people with a lot of the tea and coffee in South Galway certainly at the beginning and into the middle of World War 2,” he outlines. Colman has welcomed all sorts into the shop over the years from stars of the silver screen to the then newly-established Brazilian community, from the Anglo Irish aristocracy to the North Clare winterage farmers. “We have had great characters here over the years. 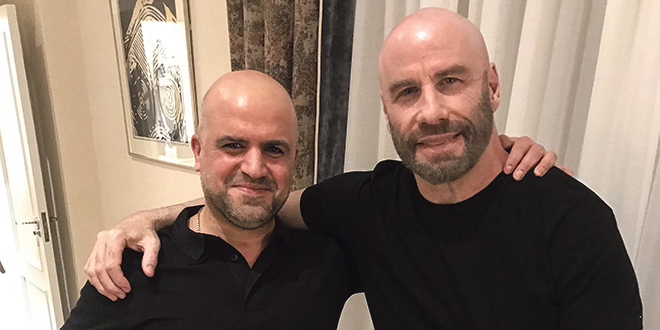 My minds’ eye gives me great pictures of people who have called in briefly to say hello and it they call in once, they always call back again,” he says. “I fondly remember in the late 1990s, a man called Walter Gottel, who lived at Lough Cutra in what was called the Gate Lodge at the back entrance to Lough Cutra estate on the Scariff Road who was heavily involved in the Bond films and played a baddie in a lot of the Bond Films, a film actor, a great character, coming into the yard. Walter, he was six foot three, his presence physically and then with his deep characterised voice, would lend himself to a grand entrance. He came to the yard anyway and five or six farmers were queuing up, bringing in wool and he said ‘well my dear boy, is there any Guinness on the premises?’ I said ‘of course there is’. “‘One. Two. Three’,” Colman points, recalling Gottel’s actions. “‘Four. Five. Six. None for you, you are working. Seven’,” he paused. “‘Eight. Nine. Nine pints of Guinness immediately.’ So while sitting in the yard with farmers bringing in wool, nine pints of Guinness were brought down from our little bar counter at the rear of the shop. Memories like that are gone today. They are history. Legislation in relation to driving, in relation to insurance, in relation to serving people in a yard, it would not go down in today’s world. These are lovely modern yet old memories,” he states. “During the making of Alfred the Great, which was shot on location in the South Galway area in particular, in Kilchreest, in Oranmore and in Lough Cutra, a lot of the top, frontline people stayed in the Lough Cutra estate and used us as a base for their shopping. Some great people like Prunella Ransome, Prunella Scales, others come to mind,” he adds. A few years ago Colman received a visit from Yabo Yablonsky, author of Escape to Victory, who he had met when he lived at Lough Cutra a decade earlier. “Yabo was a great character; he called that time on his way to a festival in Donegal that he was invited to,” he notes. Being so close to large estates has been of immense benefit to the town of Gort and especially to businesses there, Colman believes. “Lough Cutra and Coole Park have been two great people to support our business. If we go back historically there was Lord Gort who lived at Lough Cutra Castle and who was a personal friend of my father. At that time his family lived in Lough Cutra, one of the great estates of the West of Ireland which is now privately owned. It has been suggested to me that once it was the biggest stretch of privately owned inland waters in Ireland but that was never enforced. In effect that would mean the high water level of the lake to the low water level of the lake would be private so in other words during the summers farmers adjacent wouldn’t be allowed to water their cattle, that never happened. They were allowed by the present and past owners to use the facilities of the lake, including Kilbeacanty and District Anglers Club who are there today,” he continues. Publican/Hardware shop owner and wool merchant Colman Keane and his son Peter with some of their old ledgers and the hoop that WB Yeats used tie his horse to, in the family’s premises at Gort. Photograph by John Kelly. Even the more modest Thoor Ballylee, and its residents, shopped locally. “The type of shopping done was for necessities in those days rather than coming for perfume to a chemist shop. If you came to a chemist shop you came for a cure. You didn’t come for optional extras. Yeats came here for the very same thing – tea, coffee, sugar and I’m sure he never came here for butter because I’m sure whoever was in Coole at the time made their own country butter. This would have been for flour that kind of thing,” he said. Colman’s father’s Ger was born in 1910 and Yeats was well known and living locally when he ran the shop. “My father told me he was a very deep kind of person. He would be sitting in his horse cart at the front of the shop in a pensive mood and if somebody said hello, he might not hear them. Maybe he was writing a poem. Maybe he was thinking about writing a poem. 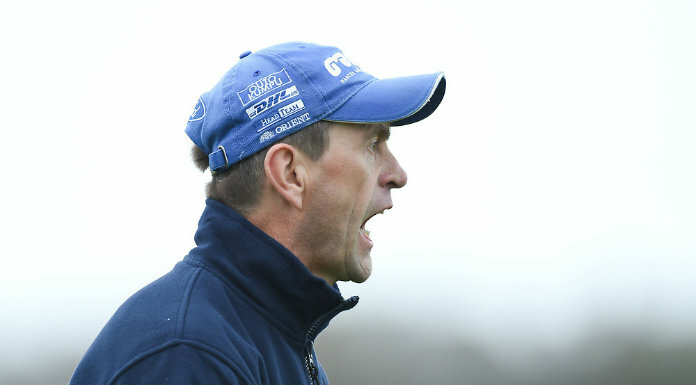 Maybe he was thinking about Ballylee, wherever. He was a very deep and imaginary character; I am led to believe, from his shopping here,” he outlines. Pauline, Colman’s wife, reveals one of her favourite yarns from the family annals. “Our youngest son was 11 at the time, he’s 17 now. Colman’s uncle, he only died last summer, he was 95. He was at our house. He used to come on holidays to us every year. He was talking about Yeats, and he said ‘you know that one place he shopped was in yere shop and he always kept a book under the counter. He would pay at the end of the month or whatever’ but he said, you know he owes ye money. So our youngest fellow pipes up, ‘well uncle Con, what’s our chances of getting it now?’,” she laughs. Colman has an anecdote he reckons the poet himself would like. “In South Galway we had an influx of Brazilians to our community approximately 15 years ago and at the time I found out that the national sport of Brazil was football and second, and on occasion to the fore of that, was fishing. I befriended quite a few as I fish myself. I brought these two characters, who had no English at the time to fish at the medium to high water level in Coole. People familiar with Coole will know it is a turlough, so during the inter if it floods all over the place and in the summer time it is practically drained dry. So this is at medium level so as we fished, after about an hour I caught a pike about six pounds weight and looked at the two lads. They were amazed to see such a fish. It was the first time they had ever seen a pike. I got a stick and staked the pike on a stick to pick up the pike on the way back,” he recalls. “The Brazilians had no English whatsoever and they said ‘no, no, no, no, no,'” Colman recalls. He imitates the miming of his fellow fishermen who at this point were making chomping noises and nibbling the air. “I didn’t understand and they started carrying it. I said ‘no, leave, leave’,” he says, but his cohorts were unconvinced. As the trio walked around a well-known rocky area at the lake, the unknown terrors of the Brazilian men began to emerge again. “We were crossing over boulders of rocks, 10 or 12 foot high approximately down to four foot high. As I stood on the first rock one of them pulled me back and he broke the branch of a tree and he started pushing it down between the rocks. I couldn’t figure it out. Then he went ‘sssss’. I still hadn’t a clue,” Colman claims. “We caught two pikes that day, we had little conversation but a lot of education, I suppose, but as we got back to the car park at Coole to go home, there was another Brazilian there who had perfect English and I asked them to explain to me what had happened with Sebastian and Pedro. ‘The reason they wanted to bring the fish with them, even though we were walking back the same way, was that if that was in Brazil, in three minutes the wild animals would have it ate,’” the first mystery was solved and Colman enjoyed it. The spontaneous translator explained what had happened at the rocks. “’In Brazil that would be full of snakes, so they were poking the ground for snakes.’ I started laughing hilariously at this, then I started thinking while I was driving back if Yeats were alive today and heard this, it would be the Wild Snakes at Coole, not the Wild Swans at Coole'”, he laughs. According to Colman, the Brazilians who came to Gort were not just good fishing companions. Brazilians were very good for business people in this town. In their earlier days they didn’t have a mode of transport. They shopped locally. They bought locally. They worked locally. They were very, very good to this town,” he says. The recession though has taken its toll on Gort, its economy and its Brazilian population. “The mass movement of labourers throughout the world took our then possibly two or three thousand Brazilians down to two or three hundred in a matter of months,” he states. “Gort as a shopping town, suffered, like all towns in the recession,” Colman adds, but other factors have compounded its impact in South Galway. “I have seen the onset of a motorway coming into the town; it is murderous from the NRA and County Council not to have had a second entrance to the town. Business people, the chamber of commerce, individuals, tried to fight it, they went to every political level but the NRA had their minds made up before they ever built it – that’s it….It has put the motorist in the position to bypass Gort other than needing petrol,” he continues. Pay parking, and restricted parking, are both further obstacles for business people in the town. “Another thing that has hit business in this town, it may not sound a lot but it is psychological rather than financial, that we have pay parking once the motor way came. It is a bit like putting the cart after the horse, in front of the horse, beside the horse, but it is not right,” he says. “From the end of Crowe St to the corner at Tommy O’Donnell’s pub, there is no parking for 200m on that side of the street. None. The post office is there. There are other essential businesses there, the bank is there. I am a humble shop keeper I don’t do the planning of this town. I certainly am very much against a lot of what has happened. They say it is happening in every town. That is one reason those in power might say. It is the future. It is happening everywhere. Gort has more restrictive parking, than pay parking overall percentagewise. You cannot park here, you cannot park there for various reasons or for other reasons like disability parking or loading bays but they are needed. They are the ones that are needed but the other restrictions are taking from the percentage of parking that is in the town. It has hit a lot of businesses. It has hit family-run businesses. These are not corporations,” he outlines. Changing, and increasing, legislation, Colman asserts, is another heavy cross for family-run firms. “To keep up with legislation, you would nearly need a degree. From the front end of the shop to the back end of the feed store, we could have 19 inspectors in any one year to address those particular elements. Life has taught me. I didn’t go to college to learn it but today you would have to go and do a business course associated with the management of business,” he suggests. The arrival of large-scale international supermarket chains has also put pressure on small businesses, Colman claims, while mass marketing of products has brought a notable change in the way people shop. Despite all this Colman believes with his generational experience that the future is bright for Gort but it will be brighter if the whole community takes responsibility for it. “You have had the inclusion in the imagination of people the idea that they have to go to a city to shop but it is beginning to change. Things are beginning to change. Gort improved this Christmas. I have to say. It might be circumstances, due to bad weather, people didn’t bother going to cities. I feel myself that if a housewife with small children shopped in a town like Gort instead of shopping in shopping centres, and larger municipal cities and towns, they would find their baskets and wallets would not be as heavy or empty (respectively) as they are,” he notes. “I see Gort has turned. There is an improvement. If you ask how much, I cannot tell you but there is a better smile on people’s faces,” Colman concludes.